In this three-part series, we are going to explore some of the varied and creative options you have for preaching. I hope that it will help each of us to think creatively and inspire you to approach your preaching from new angles. You can read the first post asking “Can we break the mold?” here. The move toward preaching in a dialogical form is not a sudden or recent development. There are volumes of material on the subject. You don’t need to pour through all of that material to begin thinking and practising preaching that takes the form of a dialogue. However, there is one critical notion that must be explored before we dive too far into the practicalities of the subject: What do we mean by dialogue? This question is the reason why there can be volumes dedicated to the topic at hand. Though there may be an earlier entry point to this discussion, I find one of the work of Fred Craddock to be a good place to begin. In his significant work As One Without Authority, he wrote much about the nature of language how it functioned. He asked critical questions and drew striking conclusions about preaching that have reverberated through the contemporary landscape of preaching and remain important for our purposes. In other words, there is no preaching that is truly a monologue. Yes, generally one person speaks, but Craddock suggests that in the interaction between speaker and listener will always generate a dialogue, even if only in the head of the listener. While they may not say anything, the average listener is arguing, thinking, and responding to the message they are hearing. When we suggest that preaching takes a dialogical form we are suggesting that the preacher take a closer look at the relationship between preacher, sermon, and listener than before because regardless of the intentions of the preacher there will be some form of dialogue. To lean into a dialogical form of preaching is to take hold of this dialogue and to make use of it for the benefit of the listener. There is a scale on which the term dialogue is applied to preaching. It remains a task of the preacher to decide how willing they are to encourage dialogue and to what length they will go to make dialogue happen. No matter how comfortable you are with the idea of preaching as a dialogue, there are things you can do to make your preaching dialogical. Here are three different levels of commitment to dialogical preaching and what you can do to embrace dialogue. For some of us, the idea of having a dialogue about Scripture and the nature of faith is too risky. There is a fear that dialogue will muddy the water. The value of politeness or our cultural lean towards tolerance mean that when we dialogue we lose sight of our core message. In fairness, there is a great risk in dialogue and these fears are not without some basis in our experiences. If this is how you feel about dialogue than jumping from a traditional sermon form to dialogue may be too much. For you, I recommend acknowledging the dialogue that we noted from Craddock’s work and trying to raise your awareness of that dialogue as you prepare and preach a sermon. An easy change you can make is to think about your preaching as a formative rather than simply as authoritative. This isn’t to suggest that there isn’t an authority in what you are saying but instead that your voice, as the preacher, is one voice with the opportunity to shape other people. Imagine the response people will have to what you are saying and try to address it as best you can. 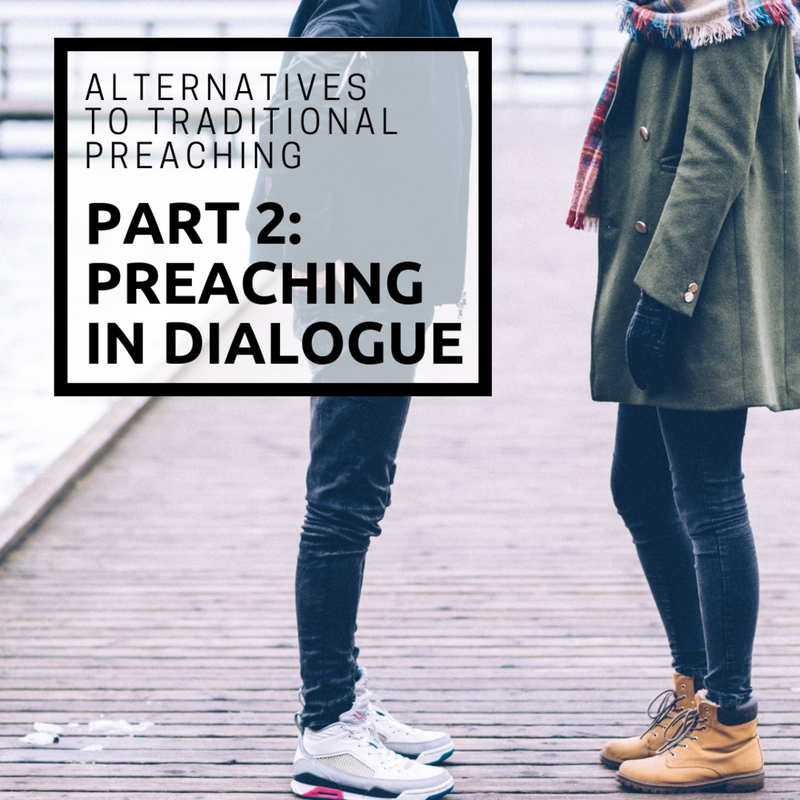 This second approach lands in the middle of this issue and suggests that if we can acknowledge that dialogue is taking place, we can participate in that dialogue by including it in our sermon. The truth of the gospel can live up to the questions that society has for the church. Instead of ignoring these meaningful dialogues, why not place them at the centre of your sermon? Explore a complex subject from a wide range of perspectives, including scripture, and make a compelling case for your view as a Christian, as a church, and as a preacher. Make the dialogue the bulk of the content in your sermon. A preacher who wants to include dialogue must take on board the fact that they are but one voice in a myriad of voices that the average listener is engaged with. Instead of ignoring these voices, we should be engaging with them and actively including them in our preaching. The final form of dialogical preaching takes the obvious course of action and makes dialogue a regular part of your preaching. Take a few Sundays a year and instead of preaching create small groups and guide a discussion in your community. Create space in your church or online where people can ask questions or give feedback on recent sermons. Invite someone to co-preach with you. These are just some of the ways you can include more tangible dialogue in your preaching. If you want to look closely at how one church does it or just be inspired to make these sorts of changes check out Doug Pagitt’s Preaching in the Inventive Age. This concludes our discussion of dialogical preaching. Hopefully, this has given you ideas and resources you can use to expand your preaching. Keep an eye out for the next post in the series.